SuperSU zip is an Android ROOT package that can be installed using a custom recovery like TWRP to get ROOT access on an Android Phone. SuperSU ROOT is developed by ChainFire. 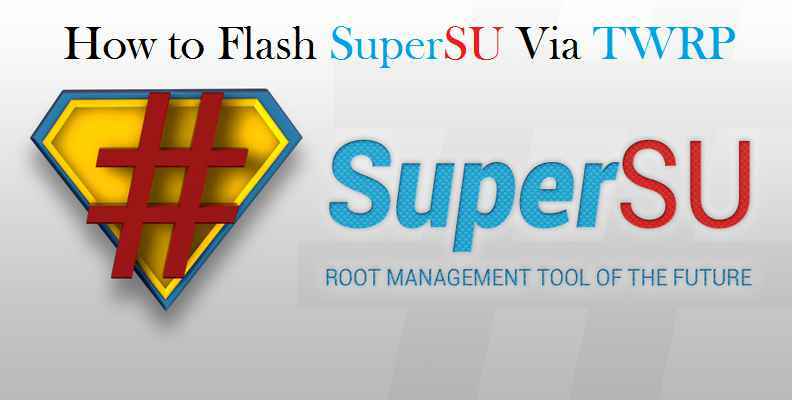 Here you will find SuperSU zip Download link and how to ROOT using SuperSU. INSTALLING SUPERSU ZIP TO ENABLE ROOT ON YOUR ANDROID PHONE MAY FAIL AND MAY ENDUP IN BOOTLOOP OR A BROKEN PHONE. HAVE A BACKUP OF THE CURRENT OS BEFORE INSTALLING SUPERSU ROOT ZIP PACKAGE. Installing supersu zip may require unlocked bootloader on your phone, which may VOID the warranty and may delete all your data. Before proceeding further you may consider taking a backup of phone data. At last, but not the least, You are the only person making changes to your phone and I cannot be held responsible for the mistakes done by YOU. Do this at YOUR OWN RISK. In general, SuperSU is a tool or a utility that can enable ROOT permission on an Android Phone. SuperSU ROOT package is in a zip file format which can be installed via custom recovery such as TWRP, and contains code or script that copies the su binary into Android system. This su binary is the one that enables the super-user privilege or we say ROOT privilege for an pplication who requests for it. How does SuperSU enables ROOT on Android phone? SuperSU ROOT zip package basically copies the su (super-user) binary into the Android system and gives executable permissions. This su binary is the primary executable file that enables ROOT privilege when asked by an application. This is a basic Linux thing. And you know, Android is built on top of Linux kernel. As long as the su binary is there in the system file and it is enabled with executable permission, the corresponding Android phone is treated a ROOTED phone. What is the benefit of Rooting? There are many endless possibilities are opened when you ROOT your Android phone, in this case when you ROOT Mi Mix 2s. Why you should NOT ROOT your phone? What is the disadvantage of Rooting? Make sure your Android Phone’s bootloader is unlocked before you install the SuperSU zip to enable ROOT. – Here is a guide that explains how to Unlock Bootloader on an Android Phone. After unlocking the bootloader, make sure that you have a custom recovery installed on your Android Phone. – Well, this is a very important aspect of this SuperSU ROOT process. The SuperSU zip file is developed in a way to be installed via a custom recovery. Stock recovery may not be able install this. 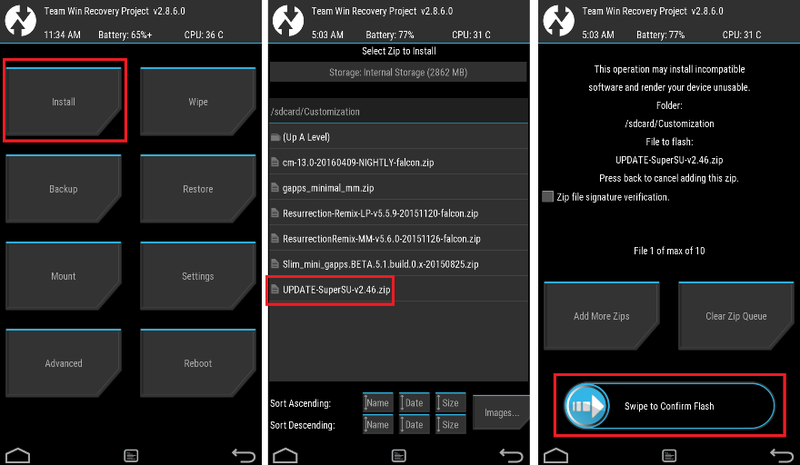 – Here is a list of TWRP recovery Download for many Android OEMs. – And, here is how to install TWRP using Fastboot. Then, Select theInstall from TWRP home screen, then select the SuperSU ROOT zip file from the file browser. Flash or install the SuperSU zip by Sliding the Swipe to Confirm Flash on TWRP screen. Wait for TWRP to flash the SuperSU or the Lineage SU completely. Once the flashing is done just reboot your device. Profit!!! Your Android device should now be rooted. How to check if the SuperSU zip has enabled ROOT on your phone or not? if you have any concerns or any difficulties following this guide, then feel free to place a reply on this thread and I assure you to help you out. After Confirming flash, i do a reboot but its stuck at cyanogenmode logo. Can you write which SuperSU version did you install? Also cna you tell on which ROM have you installed? Recently I have updated the SuperSU download link(s) on this page. Try with the latest SuperSU and if that does not work then try with the Stable SuperSU and let me know what happens. I am currently using Lineage 14.1 on my Samsung S4 Mini I9192 and have problem using SuperSU. File Manager can not delete any file on the SD used as internal memory. Even after giving File Manager full root rights using SuperSU we get error message that access is denied to File manager on interactive shell. Hi ruddcl, you need to flash the SU binary on the Lineage OS 14.1 ROM to get ROOT access. By default ROOT access is disabled on Lineage OS ROMs for Applications. i can’t flash the zip, it says error, what should i do? @raya_rama Can you explain more about the issue?? – Which recovery are you using on that phone? – What is the issue that you are facing? Take a picture and upload or at least put the text that you see when the error occurs. Do you have an unlocked bootloader on your phone?? If not yhen you need to unlock the bootloader first and then only you can use the fastboot to update the recovery partition. If you have unlocked the bootloader then you need to update the host side USB driver. It could be a driver issue otherwise. The arm links are broken.